Treat your dog to a delicious Turkey Christmas dinner. 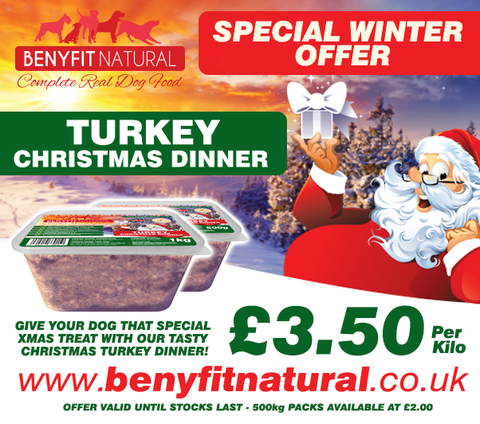 Our Christmas Turkey Dinner is made using raw British Turkey thighs and carcass with the bone in, heart, liver, carrots, broccoli, swede, whole eggs, kelp, herbs and flax seed oil. These ingredients are carefully combined in a ratio that will provide any working dog with the nutritionally balanced and complete diet they deserve. As always, there are NO additives, NO flavourings, NO colourings, NO fillers, NO animal derivatives, and NO grains; just wholesome raw food a dog would naturally eat. Previous Previous post: The Truth About Commercial Pet Food and Treats! Next Next post: Was your dog home alone today?